Before we moved to London, we thought cycling would be a useful way to offset the adjustment to life without a car. Then we watched a few too many episodes of 24 Hours in A&E with severely injured cyclists, and, subsequently, moved over and realised that many 'cycle lanes' in London leave a bit to be desired. If you're lucky, you share a lane with buses. Quite often, cycle routes are just regular roads with no cycle path at all, but designated as part of a cycle network. My bike came across in our shipment, so for our first few months in London I couldn't have cycled even if I'd wanted to. We did a lot of walking. Supermarket trips were limited to what we could carry in backpacks and with our hands, and if we wanted to visit somewhere more than 4 miles away, we had to figure out a public transport route to get there. Home delivery was incredibly useful for heavy objects. Over those first few months, we saw that there are some real, off road bike paths around. You just have to hope you can get where you want to via those paths. We also spotted cyclists managing quite competently amongst the traffic, and identified local roads we'd be happy to cycle on. Fast forward to now, and we cycle a lot. It's how we get to the supermarket on weekends (although after I took a tumble last year, Mr Bite carries the filled panniers! ), I ride to work 3 days per week, and Mr Bite rides to work when the weather is fine (at the moment, pretty much daily). It's great, and I love it. These local routes don't really rely on bike paths, but they are on roads without too much traffic and my route to work is designated as part of a cycle network. I don't know quite what this means given I'm on regular roads, but drivers seem to be considerate of cyclists, and the roads are generally either quiet or wide or both. On the weekends, we have also ventured further afield by bike. The culmination of our cycling adventures (thus far!) 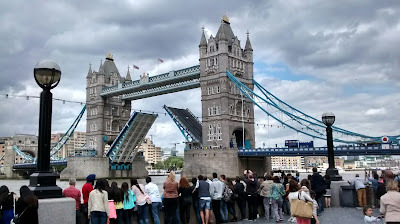 was last weekend, when we cycled to Tower Bridge, watched it open, and came back via a loop along the north side of the Thames. As with many things in London, the cycle paths north of the Thames were better than those to the south. On both sides, though, a network of paths and road sections integrated with the long-distanced Thames Path walking trail. This made it a relatively easy journey, and a scenic one. I realised on that outing that cycling in London is all about careful confidence. Where I once was nervous about cars driving into me, I now know that most cars are considerate - and crucially, if I integrate myself with the traffic it flows more smoothly than if I hesitate and wait for a stretch without cars (which doesn't happen!). 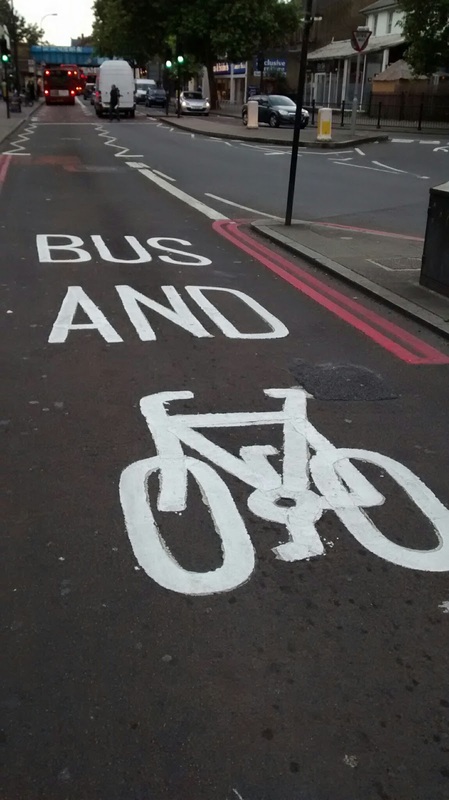 Buses are particularly considerate to cyclists, despite their daunting size, and being able to cycle in bus lanes means you often move faster than cars and get to go on slightly better routes. 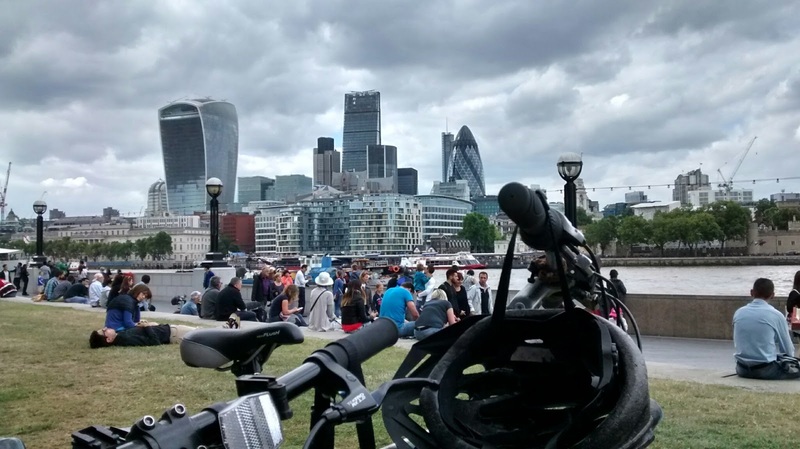 So whilst I'm not ignorant of the risks, and would never go out without a helmet, cycling in London can actually be really fun. 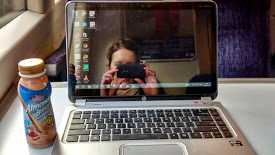 It beats carrying everything by hand and needing public transport to travel more than 4 or 5 miles. 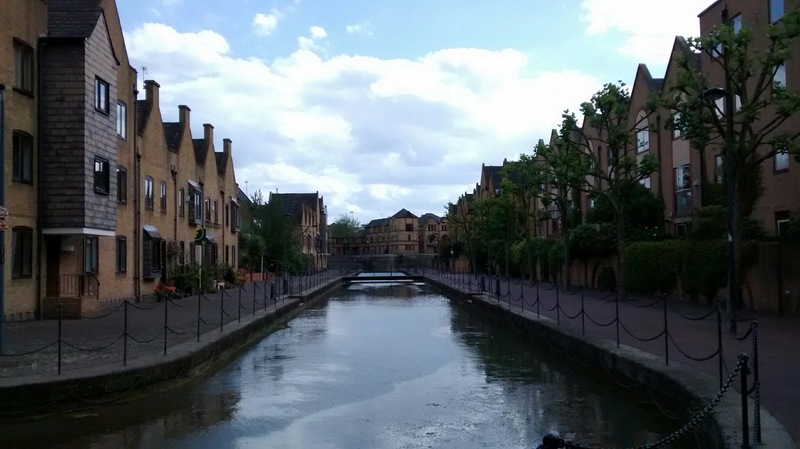 It also allows for new experiences, such as cycling across Tower Bridge, and discovering the impressive cycling lanes around the old docks in East London (below). St Katherine's Dock - the left hand side is all a cycle path. If you want a break mid-cycle, London is full of opportunities for that too. 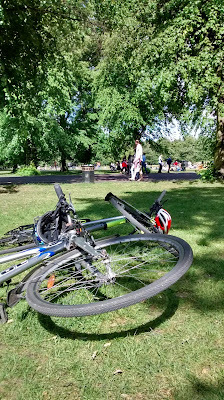 At this time of year in particular, relaxing in a park mid-cycle is really delightful. For now at least, I am a convert to London cycling (although you still won't see my darting between cars in heavy rush hour traffic). It's nice to know that I can get to a lot of places by bike if I want to - and have fun in the process. Do you cycle regularly? Are there any cities or places you think particularly bike friendly? 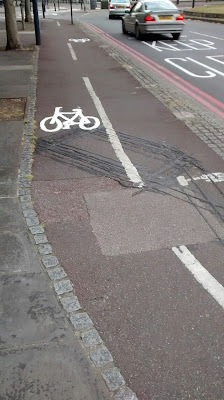 I am glad you have found your cycling groove in London. I think I would find it daunting. Some roads are definitely still daunting, but then again, so were some in Perth. I guess it's learning where and when it is manageable! Oh, that's awful :( There are certainly some roads that just aren't bicycle friendly - anything with a lorry I would suspect. I am amazed when I see people on their bike in 3 lanes of heavy traffic, darting between cars (not that the person who died was necessarily doing that, accidents can happen anywhere I guess). It sounds fantastic to be doing lots of cycling - it is sometimes the best of walking and driving in that you get somewhere quicker than walking but you do get to look around you a lot more than driving. And you always feel better when you arrive. I'd love to able to ride along the thames - I think I would have found the idea of riding in london daunting. I still find that most people I know who cycle regularly have their story of accidents (do you and Mr Bite have one) - heard a couple this week, but I also agree with you that there are ways to minimise risk - though I always wonder in Melbourne at cycle lanes that peter out at the traffic lights. Glad to hear you eventually became more comfortable with cycling. It was pretty daunting when I started, too, but you just get more comfortable as you get used to it. My worst nemesis on the bike are the streetcar tracks (my tires can get caught) so I always try to take them at 90degree angles. Otherwise, we have some bicycle only lanes but the infrastructure could be way better here. Oh the scenery alone makes it look worthwhile! I remember when I started to cycle on roads here in Australia, I was worried, but as you say, if I ride confidently *most* cars are very considerate. It's much easier now the laws have changed to protect cyclists, but perversely, I ride less as it's hard to do with two small children. Regardless, I think once one has cycled and shared a space with bigger vehicles, it makes you a much more considerate driver too! Yes! Definitely - I cringe now when I think of what I used to see as a considerate amount of space to leave around a cyclist when driving.